Orlando is a paradise for tourists and it has developed a sophisticated tourist infrastructure around its abundance of both manmade and natural attractions, which are some of the most popular in the world. Boasting Walt Disney World, Universal Studios, Kennedy Space Center and the Epcot Center among others, this part of Florida is full of family entertainment that will keep you and your children occupied for days. While most visitors head to Orlando in search of Mickey Mouse and friends, visitors can also enjoy the miles of nearby Florida coastline. This perfect balance of fast-paced theme parks complemented by peaceful scenic beauty makes an ideal combination for a perfect getaway. Visit Cypress Gardens and admire the exotic range of flora and fauna before riding on some of the most terrifying rides in Florida. 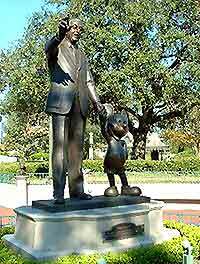 Be swept away by Disney magic at Disney World, consisting of four parks. Mickey and friends offer rides, performances, interactive exhibitions and much more. Discover what lies behind the scenes at Universal Studios and see some of your favorite film sets and fantastic special effects. Cool off at Wet 'n Wild, with its slides, lazy river, wave pool and a number of water-based rides. Spend a day at some of Orlando's museums. Favorites include the Orlando Science Center and Ripley's Believe it or Not. Relax and unwind in the city's parks, with Big Tree Park containing some of the largest and oldest trees in the country. Please your visual senses with a trip to the Orlando Museum of Art, boasting contemporary American art as well as international and African works. Drive to Busch Gardens, where the whole family can enjoy more rides, thrills, animals and adventures set among natural beauty. Launch your day with a trip to Kennedy Space Center and discover the science and engineering behind space shuttles or watch a film at the IMAX theater. Clap and scream while simultaneously getting covered in water at SeaWorld, featuring performing dolphins, killer whales, seals and sharks.